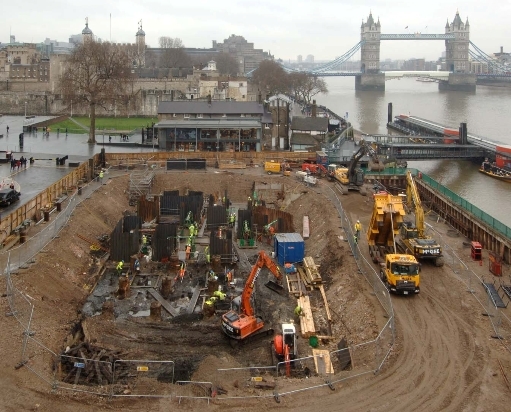 Museum of London Archaeology are carrying out archaeological excavations, over a period of about sixteen weeks, as part of the redevelopment of the Three Quays House site on Lower Thames Street. The new building, replacing early 1960s offices, will consist of 158 apartments. 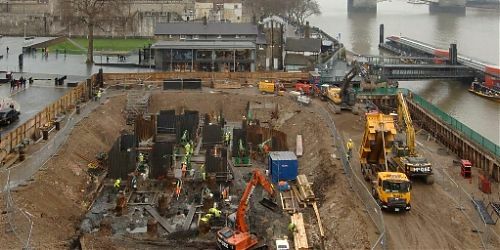 The site is immediately adjacent to the TDP key site at Custom House and next door to the Tower of London. The site has been evaluated several times over the last fifteen years and summary information about the earlier work is available online via the London Archaeological Archive and Research Centre’s website database under the site codes LTS95 and TQH02. 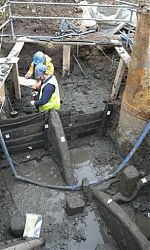 The excavation strategy is an interesting case study of mitigation and preservation in situ, where the positions of the trenches have been determined by the locations of the foundations of the new building. 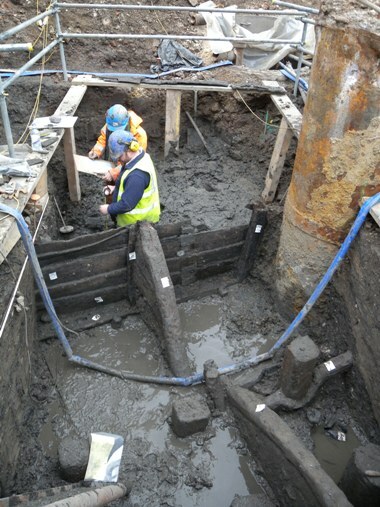 Only the archaeologists of the future will be able to tell us whether this strategy has been successful in preserving the stratigraphy which will remain buried under the new development…..
More information about the current MoLA excavations is available on their website..